Those of you who have been reading “McCullough Writes” for a while may remember my tale of guest-speaking at a local high school. Well, I recently had the privilege of embarking on yet another adventure as visiting author; this time, at Cranberry Junior-Senior High School–my old Alma Mater! With a visitor’s badge and a briefcase full of notes, I took the scenic route to Room 201, amazed at all that had changed–and enjoying all that had not. The library computers may no longer take floppy disks, but the prerecorded bell still cuts off inexplicably one-third of the way through the final electronic chime. Ah, memories. Though I may spend my days surrounded by words, rare is the occasion that those words need be spoken aloud. Fortunately, any anxiety I may have felt about being in front of an audience was promptly alleviated by a very warm welcome from teacher and students alike. A printed sign hung outside the door announcing my arrival, and Mrs. Motter–my former seventh-grade English teacher, now instructing all seniors–made me feel right at home. From there, the journey commenced. Through four class periods, I discussed writing, storytelling and personal passion with Academic and AP senior students. Each class had brainstormed questions ahead of time, in preparation for my visit. By fielding a few of these right from the start, I was able to feel out where the interests of each class lay, leading to experiences that were more organic discussions than rigid lectures. Topics of conversation included who would play the movie versions of the characters in The Fallen Odyssey, whether my younger brother (currently a senior at Cranberry and one of my audience members) was the secret inspiration behind any events in the story, and the techniques writers use to find new ideas when the well runs dry. I was also sure to pass around a few of my rejection letters and discuss the various gatekeepers and harsh realities of the publishing industry. Upon learning a bit about my background, a common question the students had was why someone so interested in writing would decide to major in Anthropology in college. I explained that a degree in English can offer many rewarding careers, but at the time, my vocational interests had centered around Anthropology. I mentioned how studying real-world cultures later influenced the development of fictional cultures and themes, and I was sure to mention how many long hours were later spent hammering away at a laptop in a hotel room, while on the road as an archaeological field technician. l also cited instances where random bits of knowledge retained from school lessons have been used as elements in my stories, making the point that the melding of ideas from seemingly unrelated fields can pay off in unexpected ways. Another point of interest was how growing up in a small town affected my journey as a writer. This led to certain parallels between the main character of The Fallen Odyssey, Justin Holmes, and myself. Several had already caught references to familiar place-names in the above-mentioned book, and many were quite interested to hear about the origins of Justin: a not-very-brave 17-year-old high school student with a part-time job living in Venango County, Pennsylvania; who was breathed into life while I was a not-very-brave 17-year-old high school student with a part-time job living in Venango County, Pennsylvania. But most of all, class conversations gravitated toward the idea of following your own passions. We discussed how, in this changing world, there are no ‘sure things’; how the only way to really do yourself justice is to find what you love to do and do it. How the most successful and personally fulfilled individuals aren’t those who choose a track and stay on it, but those who forge their own trails. And how the availability of services on the internet–the majority of them completely free–make it possible not to simply find a job that fits your talents and interests, but to invent one. Before I knew it, my throat was sore from an uncharacteristically vocal day, and the experience was all over. I could not have been more impressed with the attentiveness of my audiences and their participation. It was encouraging to see genuine interest in the subjects of story and writing, and to see how alive and well creativity truly is. Equally encouraging was to learn of the new and innovative programs being pursued and utilized by Cranberry’s teachers and staff, in spite of Pennsylvania’s ongoing public education crisis. My thanks go out to all the students at Cranberry, and an extra special thanks to my readers. You guys rock. Also, a special thanks to Mrs. Heather Motter, and, of course, the cafeteria staff. 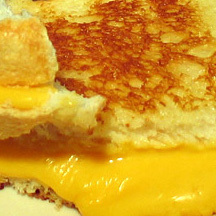 That grilled cheese takes me back. Connect with C.B. McCullough on Google Plus, Twitter or Facebook. Posted in Life, Writing.Tagged authors, education, reading, self-publishing, teaching, writing. I really like that point about being able to not just find but invent a job that fits your talents and interests. It’s a true but often unrealised point, and one that’s it great for young people to hear before they get stuck in the paths others lay out before them – well done! I went back to my own primary school almost ten years ago, when I was preparing to go into teacher training. It was really strange to be on the other side of the teacher/learner divide, to sit in the secret world of the staff room and talk with old teachers as equals. Weird mix of the nostalgic and the unnerving. What a wonderful experience for you and the students. Kudos to Mrs. Motter for having the vision to bring you in to talk with the students. You are spot on about the job opportunities in the future, most of those jobs haven’t been invented yet… and “future” is a much more short-term word than it used to be. Nice work! You may be on your way to inventing a job yourself. Reading this on my lunch break from work and wishing I had a famous Cranberry High School grilled cheese and bowl of tomato soup! Excellect reflection on what I’m sure was a great learning experience for all involved. Hopefully you’ve inspired a few future writers (or anyone for that matter) to pursue their dreams! And, now you know the vocal trauma those poor teachers endure on a daily basis! Very proud of you C.B.! The students at CHS are fortunate to have had the opportunity to hear from one of their own who is indeed blazing his own trail. I wish I could have been the proverbial fly on the wall. It is terribly exciting to watch you evolve into not only a tremendous writer but also a man of strong conviction and faith. By the way, did you get a chance to clap a few chalkboard erasers?